From 1939 to 1946, Americans gathered around the radio to listen to The New Adventures of Sherlock Holmes, featuring Basil Rathbone as the high-strung crime-solver, and Nigel Bruce as his phlegmatic assistant, Dr. Watson. Witty, fast-paced, and always surprising, these great radio plays are as fresh as when they first premiered and feature perfect sound. 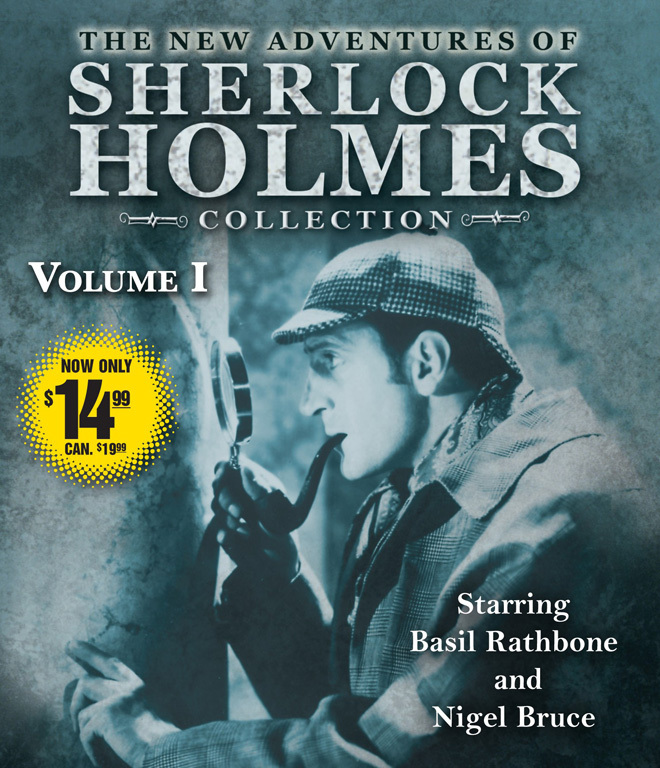 The New Adventures of Sherlock Holmes Collection Volume One includes The Unfortunate Tobacconist and The Paradol Chamber, The Viennese Stranger and The Notorious Canary Trainer, The April Fool’s Day Adventure and The Strange Adventure of the Uneasy Easy Chair, The Strange Case of the Demon Barber and The Mystery of the Headless Monk, The Amateur Medicant Society and The Case of the Vanishing White Elephant, and The Case of the Limping Ghost and The Girl with the Gazelle. The New Adventures of Sherlock Holmes Collection Volume Two includes The Case of the Out of Date Murder and The Waltz of Death, Colonel Warbuton’s Madness and The Iron Box, A Scandal in Bohemia and The Second Generation, In Flanders Fields and The Eyes of Mr. Leyton, The Tell Tale Pigeon Feathers and The Indiscretion of Mr. Edwards, and The Problem of Thor Bridge and The Double Zero.